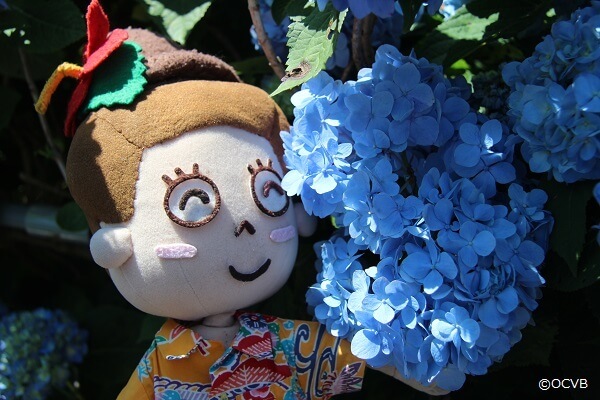 【Blog】Yohena Hydrangea Garden is Fun even in the Rain! 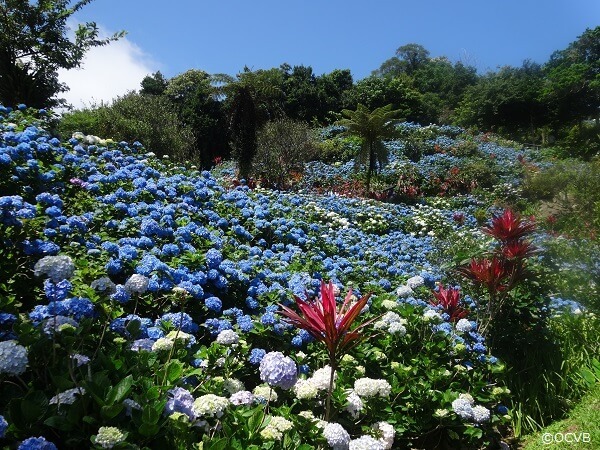 > Categories > Nature > 【Blog】Yohena Hydrangea Garden is Fun even in the Rain! 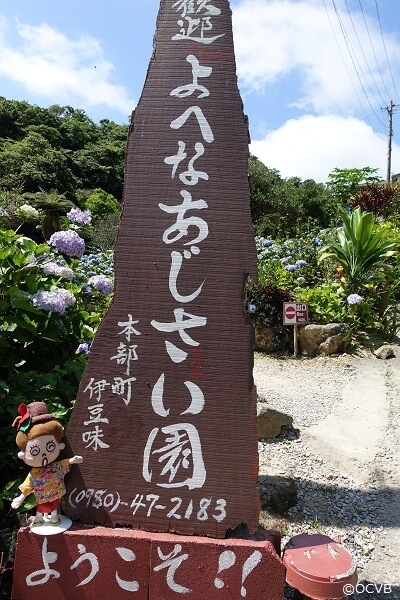 Located to the north in Motobu, it takes approximately 90 minutes by car from Naha City by expressway. 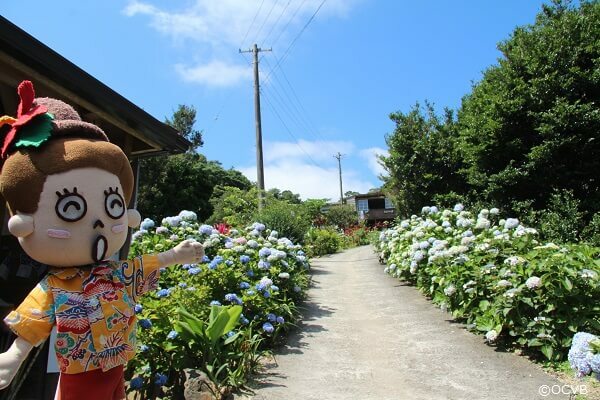 Also famous for the Churaumi Aquarium, I visited this town to see to the Yohena Hydrangea Garden, which is only open during the rainy season. 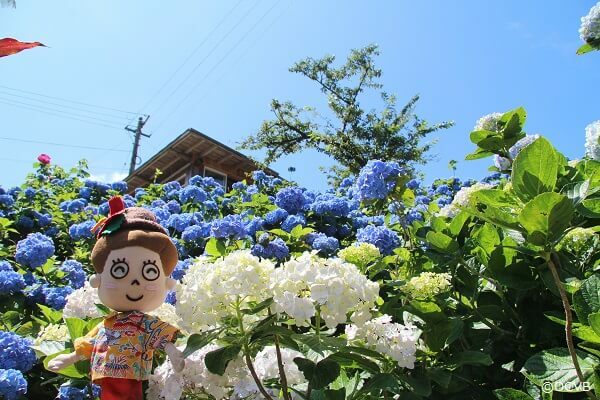 As I climbed up a small pathway, there were hydrangeas covering one side! 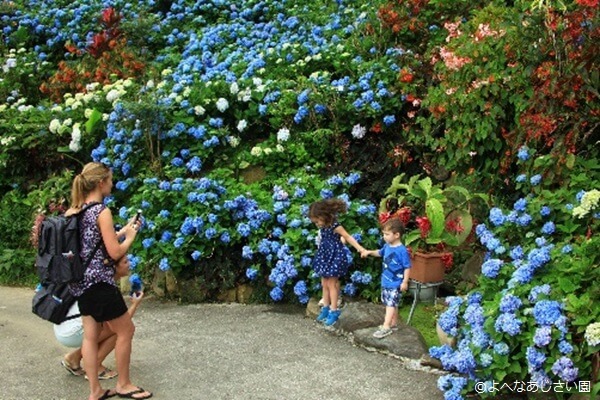 300,000 hydrangeas bloom throughout the garden, which covers roughly 10,000㎡. 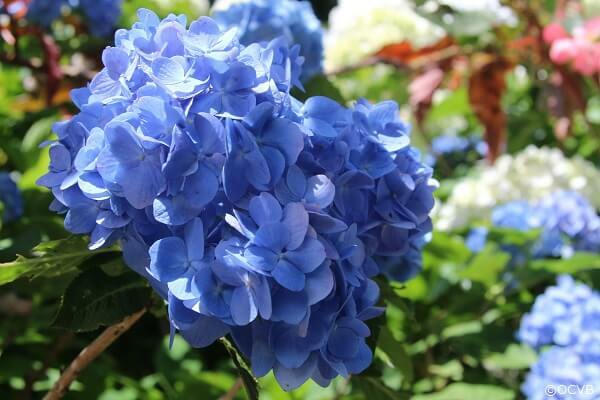 Around 40 different varieties of hydrangea bloom throughout the garden. 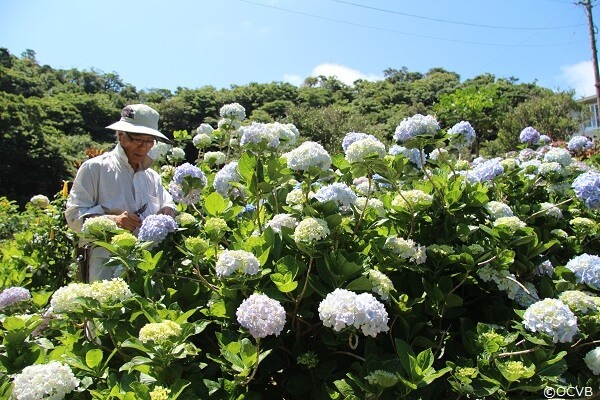 This year, the Yohena Hydrangea Garden will celebrate its 17th anniversary. It was officially opened due to an increase in visitors who had heard rumors about the garden by word-of-mouth. 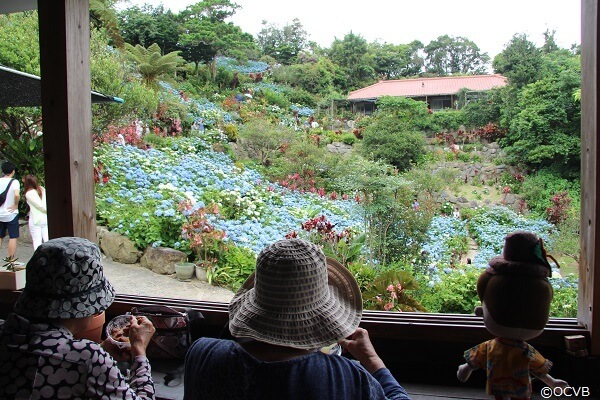 The owner, Mrs. Uto Yohena, had started planting hydrangea as a hobby after receiving two from her husband’s brother 40 years ago. 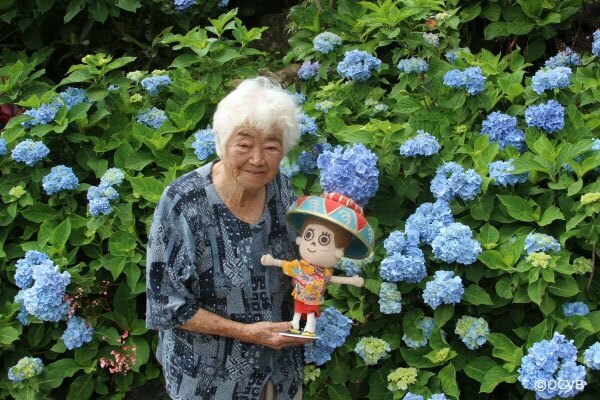 Uto will celebrate her 100th birthday this year. 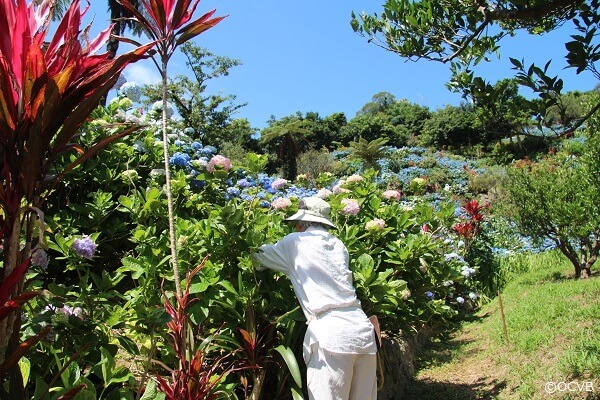 Although she has been feeling unwell lately, she is usually the one who takes care of the garden by weeding and cutting the plants. I met with Uto’s son, Tomotaka Yohena (68). 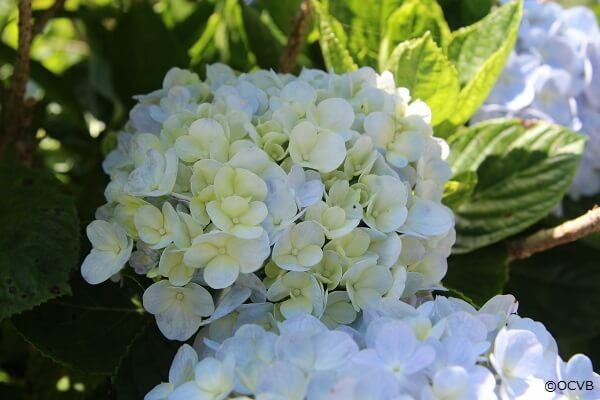 If they are neglected, the hydrangea will wither, so it is necessary to weed, fertilize, and prune the flowers throughout the year, as well as controlling pests. 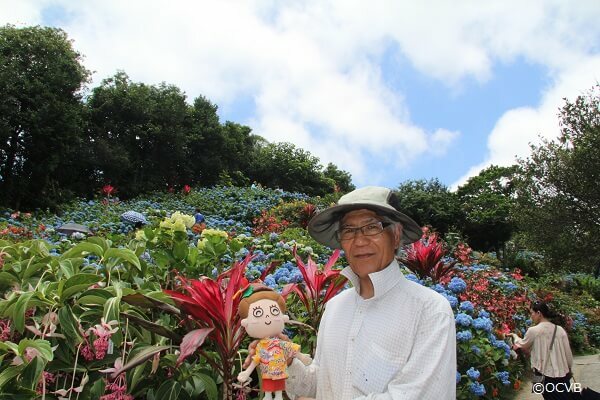 Tomotaka, who was a civil servant, said that when the garden first opened he would make a 90-minute trip from his home to the garden to attend to the flowers on weekends. 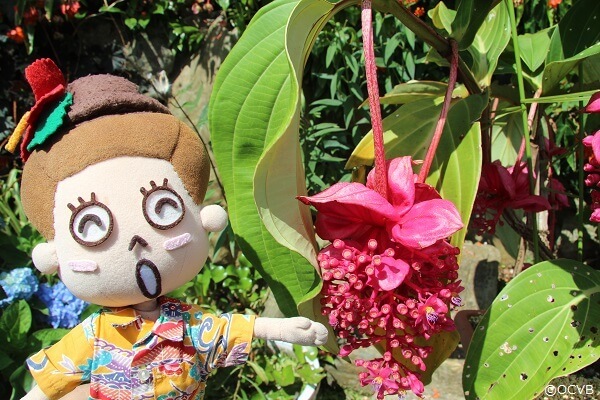 He would prune them one by one while looking out for dead branches and checking the condition of the flowers. Pest control is also done manually without using any pesticides. 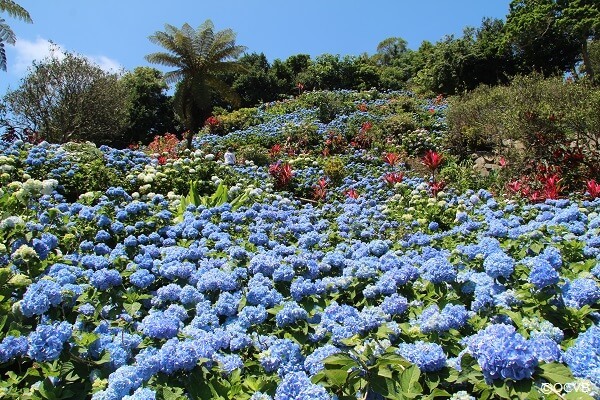 The main feature of the hydrangea garden is its steep slope. 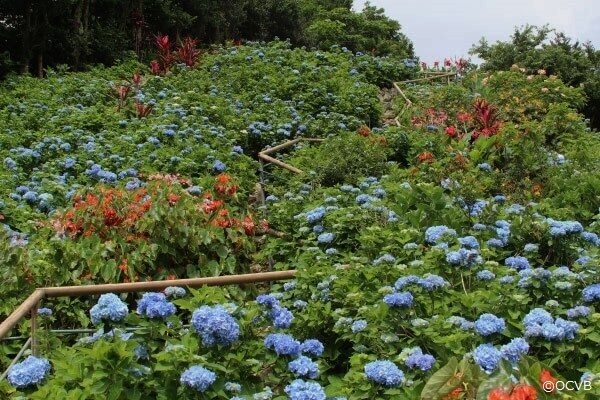 The slope has been used to an advantage, creating a beautiful space completely covered in flowers by using stepped flower beds made from logs that have been sourced from the mountain. The slope is so steep that machines could not be used. The stone pathway and handrail were made by hand thanks to the group effort of Tomotaka’s brother and grandchildren! “Sometimes I’m talking to my brother and think, just who started this thing? !” laughed Tomotaka. 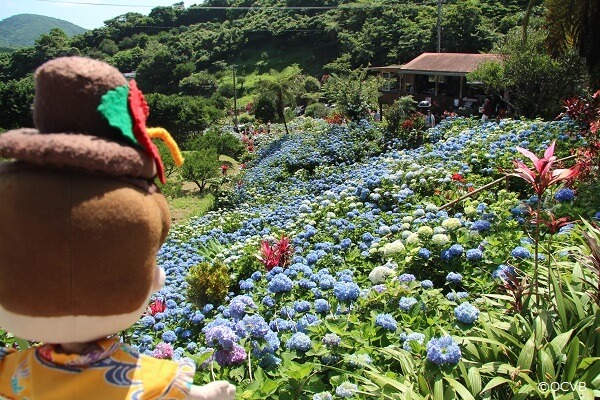 Lately the number of foreign tourists has increased, and they also receive inquiries from overseas. As for foreign languages, his wife was good at English before the garden opened and she also began learning Chinese a few years ago. Now, she can even respond to messages using simple Chinese! 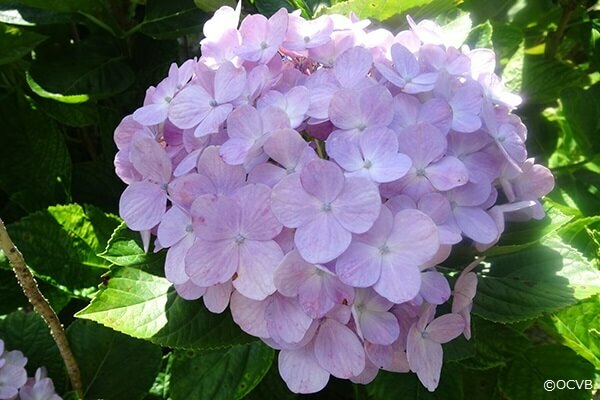 As well as hydrangea, there are also many other varieties of flowers blooming in the garden. 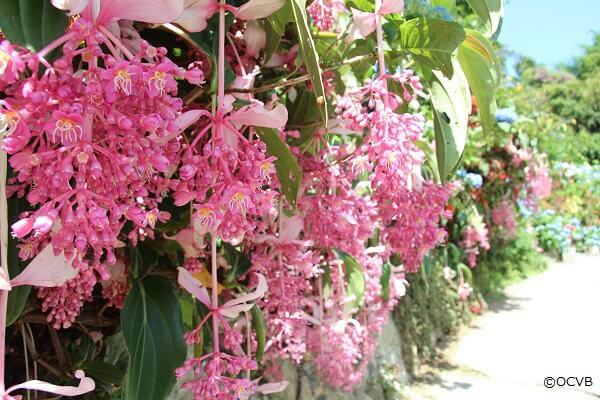 This is also a unique spot in Okinawa where Medinilla magnifica are in bloom at the same time as hydrangea. Because the number of visitors has increased over the years, Saturdays and Sundays are very crowded. For those who want a more leisurely stay, we recommend going on a weekday. 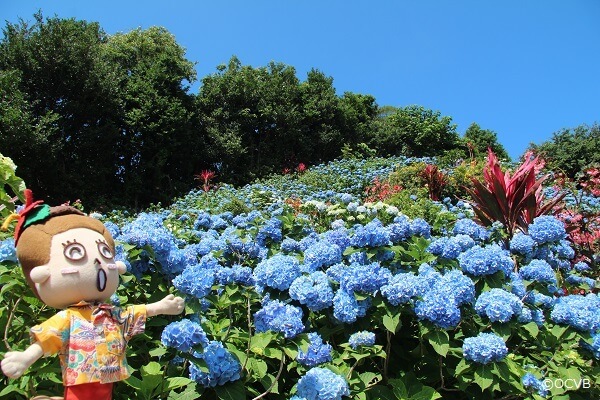 Although it depends on the weather, the hydrangea garden is open from mid-May to the end of June, so if you are in Okinawa during this time, please visit! 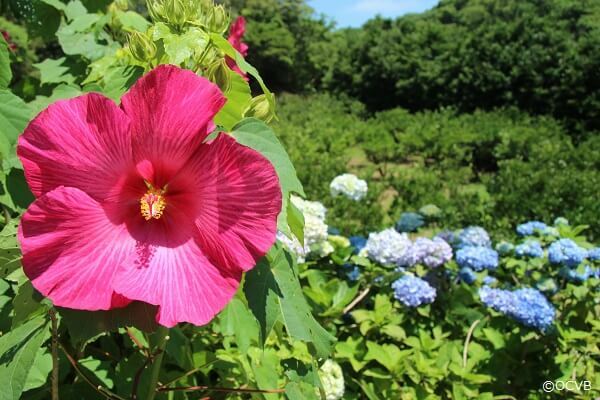 ※ Please confirm the information about the opening of the garden on its website.